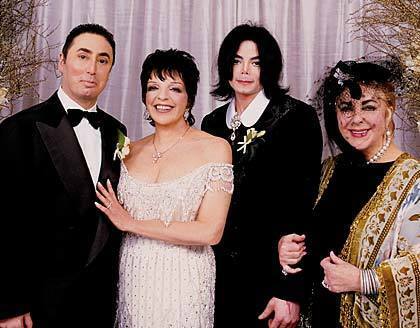 David Guest,Liza Minnelli,Michael Jackson,Elizabeth Taylor. david,liza,elizabeth and her good friend michael jackson who sadly passed away 25th june 2009.. Wallpaper and background images in the Elisabeth Taylor club tagged: elizabeth taylor michael jackson friends image photo. This Elisabeth Taylor photo might contain demoiselle d'honneur and demoiselle d’honneur. Why does it say "Elizabeth her daughter Liza..."? Ooooops could be because i was making mistakes due to it taking me over an hour to upload !!! Haha don't you love the edit feature? I am the queen of fixing mistakes. lol !!! It helps me !